It’s hard to believe that I’ve only worked at ASU for a week. It feels like a month! Don’t get me wrong–I love the job. It’s so much fun. It’s just very intense. I am teaching only two classes, but both classes meet for 9 hours per week. In addition, the American English and Culture Program at ASU packs a semester’s worth of material into 8 weeks, so we really have to cover a lot of material every day. In case you’re wondering, I didn’t make it to class on time on the first day. I would have made it, but I didn’t realize that my classroom was in the basement of the Wells Fargo Arena. I walked all the way around the arena and couldn’t find the room. The place was deserted, but I finally found someone working in a little office and she told me how to get into the basement. When I arrived in class, I was panting and sweaty. I didn’t make the greatest first impression. Luckily, my boss took pity on me and moved my first class to a building closer to the arena. Now all is good. I get to all of my classes on time, and don’t look like a wreck when I get there. 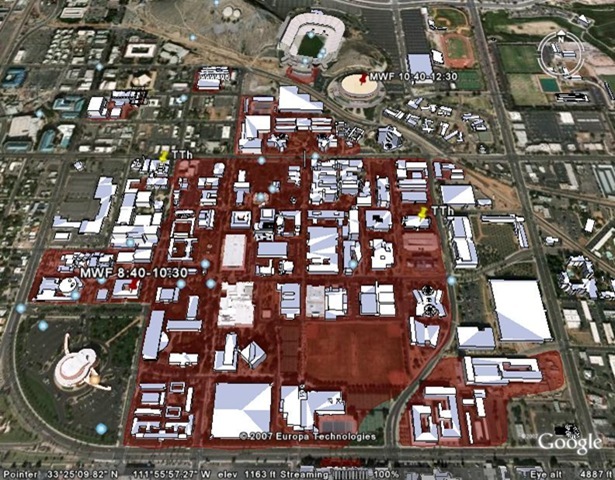 This is a map of ASU, the place where I’ll be hanging out every day for the next 8 weeks (and hopefully longer!). Dave mapped out the locations of my classes for me on this map. Do you notice any problems? Take a look at the two red pegs. These are the locations of my Monday/Wednesday/Friday classes. I’ll start these days in the Education building at 8:40 am. Unfortunately, my next class is way over in the Wells Fargo Arena and it starts at 10:40–just 10 minutes after my first class ends! So is it possible to get from the Education building to the Wells Fargo Arena in 10 minutes? Dave & I set out to answer this question this afternoon. We braved the heat and walked all over campus. First, we walked to my Tuesday & Thursday classes (those are the yellow pegs), and then we walked down to the Education building on the west side of the campus. Once there, we plotted our route to the Wells Fargo Arena, took deep breaths, noted the time on our watches, and walked as fast as humanly possible to the Wells Fargo Arena. We got there in 9 minutes. So today we learned that it IS possible to walk from the Education building to the Wells Fargo Arena in 10 minutes, but we also learned that it makes you tired and sweaty. We both needed showers when we came home, and poor Dave is limping around because he got blisters on both of his feet. I have such a great husband, don’t I? I’m going to teach at ASU!!! YAY!!!! The new semester starts on August 20th. I don’t know what I’ll be teaching yet, but I’m SO EXCITED! !